First came the feminizing of the Olympics. You can watch deformed prepubescent girls in "women's" gymnastics or figure skating 24/7 (No offense, Amanda--and that deformed comment applies only to the gymnasts, not to the skaters!). But for cool stuff like boxing and the biathlon you have to stay up until 3:00 am and watch on CNBC. That's bad enough. But now---physics too! Oh no, not physics! First came the appalling and apocalyptic revelation that J. D. Jackson's Classical Electrodynamics, text book of text books, standard bearer for all that was good and proper about a graduate education in physics, had, in its third addition, in spite of a pledge from Jackson that it'd never happen, switched from cgs units to, *gasp*, mks! Open up Jackson (his book, that is) and you now find unseemly 4πε0's strewn about the pages like mouse droppings. Sigh. 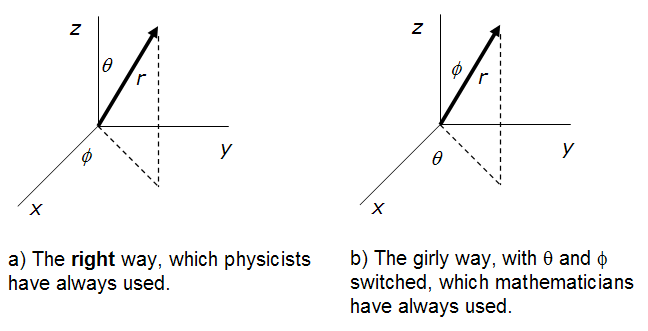 Now word comes to me that there is an even more disturbing trend in physics texts. This is only a rumor which I haven't confirmed—let's hope snopes.com soon reports that it is an urban legend. What I hear, and it brings me to my knees, is that some new physics texts are calling the polar angle φ and the azimuthal angle θ! Unspeakable blasphemy! That's how those lowly mathematicians label the angles! Make them switch! Oh, please say it ain't so! OK, there is a cool physics problem described here. When I solve it, I get a different factor than the 1/12 in the "obvious" answer. I'm inviting readers to solve it, and tell me what they get. It's driving me nuts—seems like a simple enough problem. I want to know if I am doing something really dumb.